We are hot wing loving people, and we drove a good 20 miles this day to get them. We said, “Let’s celebrate Labor Day! And the end of a great summer! 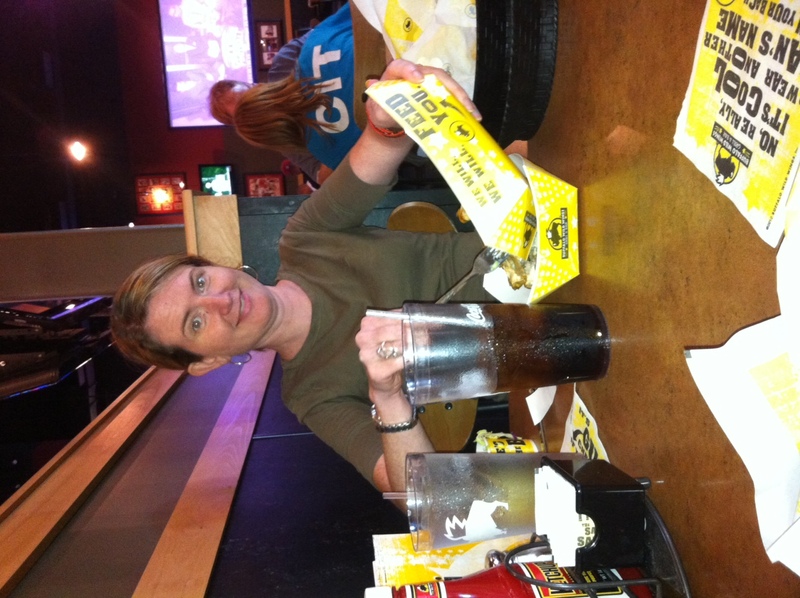 Tonight….we feast!” We didn’t say the feast part out loud, but I sure thought it. With one week of middle school under his belt, Jake plopped down next to me at the restaurant table. Instead of getting to talk to my older kid’s face, however, I was granted access only to the back of his head. We were surrounded by no fewer than 30 televisions covering every possible surface in the new chain restaurant. I looked nervously at the giant projection screen hanging precariously above my head. Baseball, football, college football, high school football, what looked like Dr. Oz, and even America’s Funniest Home Videos blurred soundlessly together while music played in the background. I didn’t harp on the boys about watching the TVs, there were just too many to ignore. I couldn’t help but watch either, just like everybody else in the crowded dining room. When you have that many people together staring at TVs from every possible angle – weird eye contact will inevitably happen. I was sure the guy with the ZZ Top Beard was looking at me because he assumed I was staring at his beard, which I was for a minute. But really, he was probably just watching whatever game was above our table, or at the very least, waiting for the screen to fall on me before my wings arrived. A girl across the restaurant with a 60’s beehive also seemed to be looking at us. Either that or she was watching the same thing as ZZ, which seemed highly unlikely. No, she was definitely looking at me, and my utter lack of a beehive hairdo, for which I was now very self-conscious. Exhausted from the hardest thinking I’d done all day, I settled back, and my ears perked up. I knew this song. I loved this song. “It’s Dead or Alive!” I yelped, “I don’t feel right saying the name of the song, because it’s not entirely appropriate… but it’s Dead or Alive…the band!” I girly clapped for unnecessary emphasis. “Depeche Mode! It’s Depeche Mode.” I girly clapped again, because now it was a terrible habit. John took the little one to the restroom as I tried to explain to Jake the significance of Pat Benetar; “60% of her awesomeness must have been her haircut,” I said earnestly. I waved my hands around my head trying to pantomime the swoopiness of her feathering. He nodded again, and I took to my phone to find a picture. When the guys returned to the table, I was flipping though my results from Googling “Pat Benatar Hair” images. I’ve Googled some stupid things, many of them twice, but this search was a first. Jake looked at the photos, and then back to the bank of TVs, immediately guffawing at AFHV (when you are a fiercely loyal fan of crotch kicking, wedding-dance-gone-wrong, annoyed animal videos, you may also unapologetically call America’s Funniest Home Videos, AFHV), “Look at that cat. How does it do that?” he said, mystified. I looked around to find the screen with the crazy cat, and sucked in my breath when I spotted something awesome. I nudged Jake. “The woman directly behind you, has Pat Benatar’s exact haircut,” I whispered. He slyly looked over his shoulder, then looked to me, nodding in polite acknowledgement. Another song came on that I recognized. I’d listened to it on my boombox in my room as a kid. “Catch Me I’m Falling.” Who sang this? Who. Sang. This? I squirmed in my seat, uncomfortable in my not knowing. My darling husband has many gifts, one of my favorites being his awe inspiring ability to immediately recognize and name the title and artist of songs; and not just any dumb ol’ songs, but 1980’s adult contemporary classics. The more obscure, the better. His childhood weekends were spent with Casey Kasem and the American Top 40. It’s obviously one of the top 3 reasons why I agreed to marry him. “I can’t remember who sang this,” he admitted. Now he looked uncomfortable too. “Stacey Q?” I guessed. Wait, she couldn’t have possibly had another song other than “Two of Hearts.” Back in the day, my friend Jenni and I preferred to call it, “Two Pop Tarts.” Hilarious. He looked at me like I was asking if he was Taylor Dayne. “Ok, so most definitely not Taylor Dayne, and not Jody Watley…right?” I was grasping now. The wings were here and my hands were saucy, but it was worth the risk. Jake looked at me expectantly, perhaps waiting to hear what the singer’s hair looked like, or where I was when I first heard that song, or maybe how Pretty Poison was the best band in the history of music and a major influence on artists he listens to, like B.o.B and One Republic. I had nothing, so he quickly turned away in his seat, going back to his wings and AFHV. Oh no. Was he….embarrassed? Annoyed? Both? It didn’t matter that nobody in this place, whether they had a Pat Benatar haircut or a ZZ Top beard, was paying attention to us. Well, beehive girl was, but I knew that nobody need be present for a tween to be embarrassed. He was a sweet kid, and was doing his best to humor me as I waxed poetic about the old timey music I grew up with. 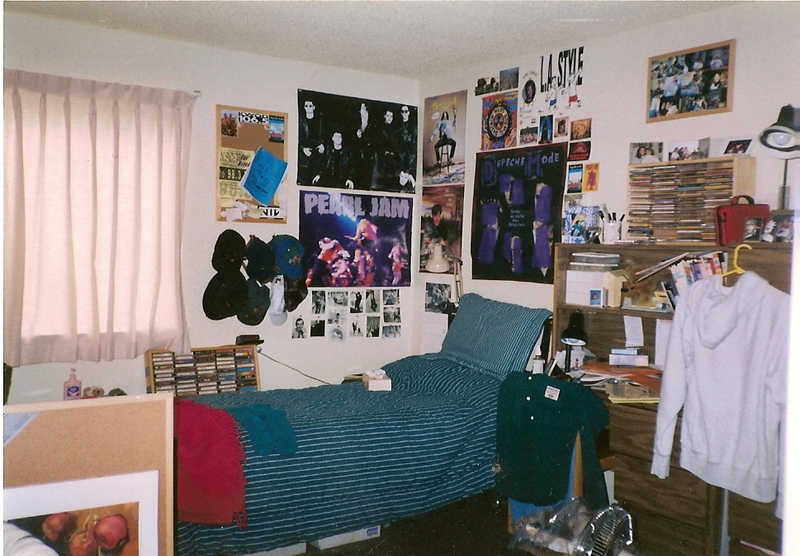 I scrapped my plans to use photos of my freshman dorm to illustrate the lesson One Hit Wonders: 90’s edition. Alas, he is in middle school, and I now hold more potential for annoyance and embarrassment than I did just a week ago – a milestone for us both. I would let him eat his wings and watch his falling down videos in peace. Just wait ’til the day though, he’s eating medium wings with his kids and he gets excited for the Black Eyed Peas on the classic hits station, and he really wants them to appreciate how the lady at the next table looks exactly like Lady Gaga. *The photo at the top is not the most flattering of me by any means, but somehow, I’m delighted by how delighted I look to be there. *The middle photo is my freshman dorm room that I shared with my roommate Heidi. 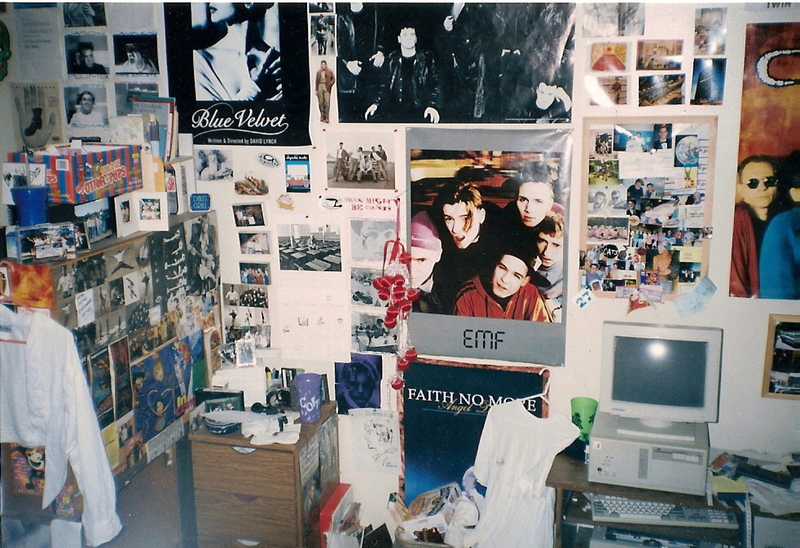 We actually SLEPT in there, in the midst of the chaos.Please note the EMF poster. *The bottom photo is my far more refined sophomore room that I shared with Liane. No EMF poster, but I do see a poster for Ned’s Atomic Dustbin and L.A. Style, and that Johnny Depp movie they screened on campus, Benny & Joon. There is a rack of cassettes and cassingles AND a rack of CDs. Everything else, I would put up again today, Pearl Jam, The Cure, Depeche Mode, INXS, and the 34,000 photos I ripped out of magazines like Spin.